The Obsidian Series 1000D features the striking tempered glass design, intelligent lighting and fan control, and the ability to record two systems simultaneously, making it the ultimate super tower PC enclosure for impressive systems. 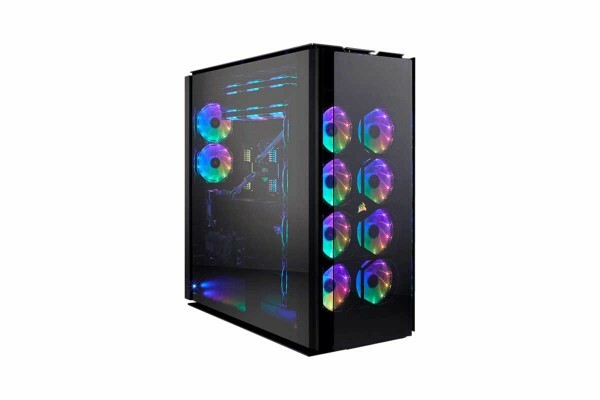 With its striking and clear contours, four tempered smoked glass viewing windows and seamlessly integrated RGB lighting, the Obsidian 1000D is the most visually stunning case in the Obsidian Series. The Obsidian 1000D offers space for a complete E-ATX and Mini-ITX system, so you only need a single chassis for streaming and gaming. Two motherboards, two power supplies, two complete PCs in one housing. An integrated CORSAIR Commander PRO controller for ventilation and lighting, together with the CORSAIR iCUE software, provides unsurpassed control over almost all aspects of your system. Thanks to the rear storage compartment with double door, E-ATX motherboard island, mini-ITX motherboard bay and power supply cover, your 1000D PC system remains clean and uncluttered. In addition to four USB 3.0 ports, the front panel with RGB LED illumination offers two USB 3.1 Gen 2 Type C ports, making it future-proof and backward-compatible at the same time. With the GPU turntable GPU mount for standard or vertical mounting, and a variety of attachment points for pumps and reservoirs throughout the enclosure, the 1000D is the most flexible and modular of all CORSAIR enclosures. Install fans and radiators with ease - thanks to modular and tool-free brackets. The 1000D offers impressive space for up to five 3.5-inch HDDs and six 2.5-inch SSDs - each in its own bay. The powerful CORSAIR iCUE software brings your case to life with dynamic synchronized RGB illumination of your complete system, customizable fan speeds for silent operation, and advanced system monitoring. Case Drive Bays: (x6) 2.5 "(x5) 3.5"